The homeowners enlisted Keskin to help rework their master bedroom, living room, dining room, and mudroom as the adjacent kitchen had recently been updated with the renovation. But Keskin wasn’t starting with a blank slate. 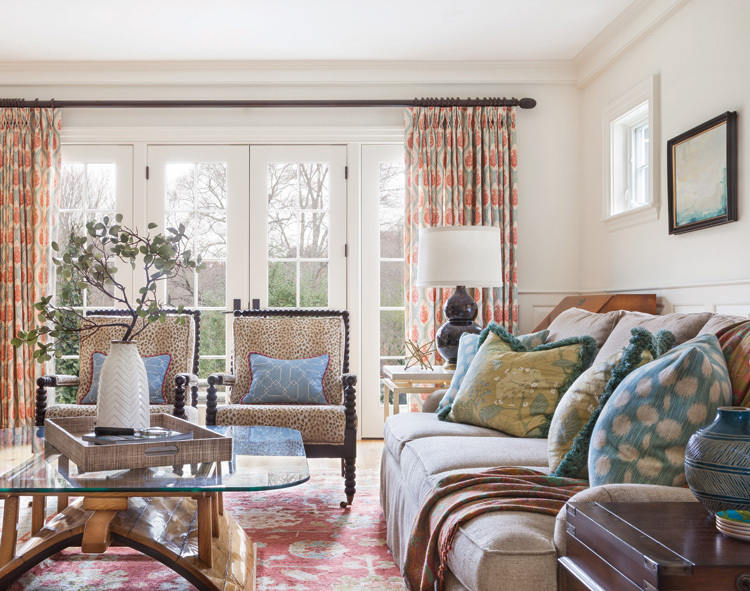 Like many of her clients, they wanted to utilize existing pieces—namely furniture and antiques they’d collected over the years—into the home’s interior design while also incorporating furniture, fabrics, and textures to infuse new life into the space. “I love when clients have existing pieces that they want to include in the home’s design, especially heirloom pieces because they make the home feel more personal, it tells a story,” she explains. Keskin drew inspiration from the kitchen, which boasts shiplap walls, exposed reclaimed wood beams, mahogany, and honed granite countertops, Carrara-marble subway tiles, and a touch of color via a light gray blue for the base of the island. “It’s such a welcoming space and we wanted to capture that in the living areas,” she says. The living room is where the homeowners do the bulk of their day-to-day living and entertaining, so it was important that it be comfortable and inviting. A coffee table—a small antique boat outfitted with a glass top—along with the area rug were two of the clients’ existing pieces that Keskin built her design around. The rug with its pops of tomato red and celadon blue served as color inspiration and led Keskin to keep the furniture and walls simple and neutral. 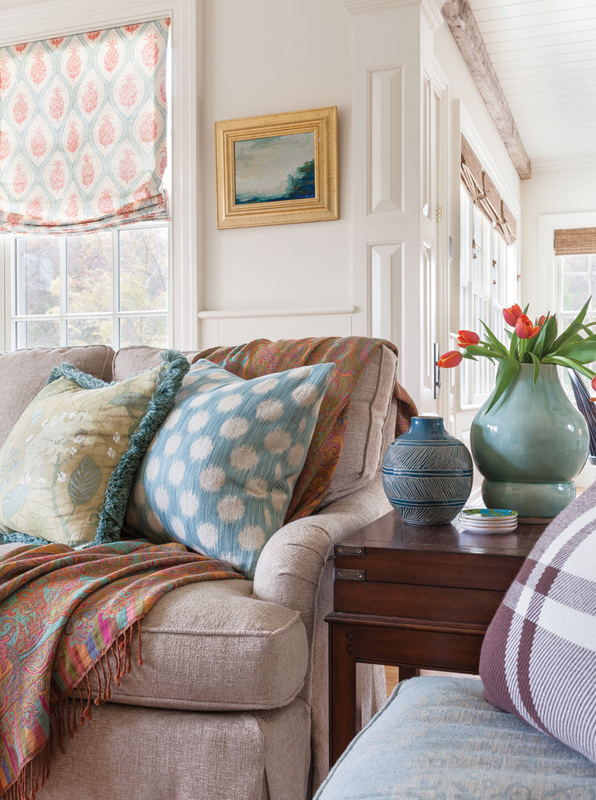 She layered throw pillows and draperies to bring color and texture into the room. The draperies by GP & J Baker set the stage with the same hues as the rug, while a pair of adjacent chairs swathed in a playful but more neutral ocelot-print fabric by Cowtan & Tout offset the colorful draperies and custom throw pillows by Jane Churchill, Scalamandre, and Kerry Joyce Textiles. “It was all about balance in this space. So, mixing tiny, bold fabrics with neutrals really allows everything to blend together,” says Keskin. The ample natural light also played a role in the interior design as it highlights the organic texture of the existing coffee table while also brightening the colorful prints and patterns. In the dining room, Keskin applied the same tactic of using the homeowners’ existing pieces as the base—the dining room table and chairs, for example, were the clients’ own prior to enlisting Keskin—as a base. A stunning blue grass cloth wallcovering by Phillip Jeffries in the room immediately adds a dose of modernity amongst the ultra-traditional furniture. Likewise, draperies also by Phillip Jeffries in a geometric pattern feel playful yet sophisticated in the traditional setting. While Keskin loved reworking the living and dining areas for her clients, she is especially fond of the mudroom. “It was a fun, small space [where] we could really push the envelope a little bit,” she says. With minimal wall space to add color to, Keskin suggested a fun wallpaper in lieu of paint. “There wasn’t a ton of wall with the wainscoting, so I convinced her to go bold with the wallpaper,” says Keskin of the Galbraith & Paul paper, which complemented the bluestone flooring. “It made the room feel bigger. Some clients are afraid to commit to wallpaper but it’s easier to commit to it in a smaller space. She wanted something different in that room and this hit the mark.” To add more pattern to the space, Keskin also added a custom cushion for the bench swathed in Thibaut fabric, which Keskin had vinylized to prevent staining. Keskin drew inspiration for the living room color palette from homeowners’ existing rug and layered the room with custom draperies by GP & J Baker complemented by a pair of chairs swathed in a fun ocelot-print fabric by Cowtan & Tout. An antique boat repurposed as a coffee table anchors the space and provides a rustic element.